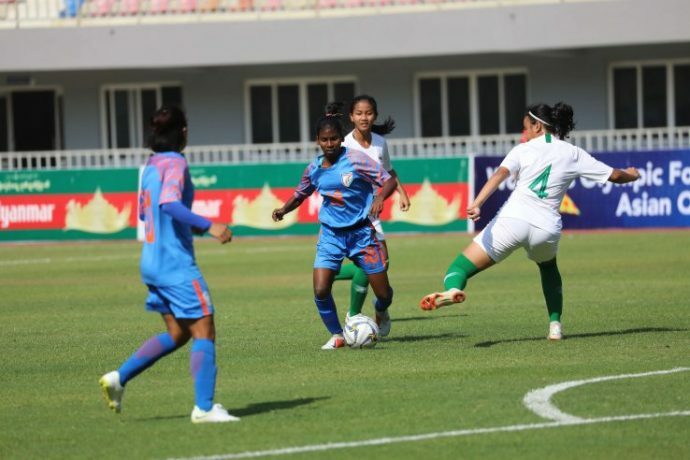 When the Indian Senior Women’s Team clash against Nepal in their second match of the Olympic Qualifiers Round 2 at the Mandalritthri Stadium in Mandalay, Myanmar tomorrow (April 06, 2019), it will be more than two foes clashing against each other. Rather it will be two friends aiming to earn valuable three points. Pleasantries aside, the two teams will be blazing all guns to come out victorious. This the third time they would be playing against each other since February. In the Hero Gold Cup, Nepal had triumphed 2-1 in Bhubaneswar, while the Indian women had a revenge of sorts beating Nepal in Nepal 3-1 in the SAFF Women’s Championship final. “We need to take our chances. Nepal possess the ability to hurt us. That was on display in Bhubaneswar. We will try to score first,” Maymol explained. “We share pleasantries off the field. At a personal level, we know each other pretty well. But tomorrow is more about who wants it more than the other,” said Jabamani Tudu in one breath. With only one team qualifying, and both India and Myanmar level on points, a win for India will further boost India’s chances for a qualification from the Olympic Qualifiers Round 2. The match will kick-off at IST 2 pm.